The first two new medical office buildings at this private health-care campus. 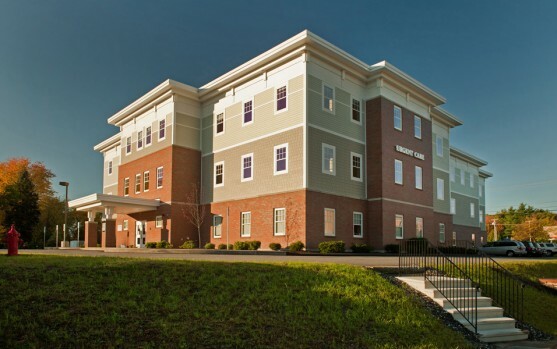 This first is a three-story, 36,000 SF building houses practices affiliated with Catholic Medical Center and Dartmouth-Hitchcock Medical Center. Medical offices at this location include: an urgent care center, a large family practice, a satellite lab, and medical specialists covering urology, endocrinology, neurology and pediatric medicine. The building’s exterior composition of brick veneer and cementitious clapboard/shingles/trim helps to reduce its apparent scale and help it to fit into the context of the Bedford community. The building has a high-performance envelope assembly plus fiberglass windows. This particular wall assembly system has become a favorite choice of our office; it has proven to have a good first cost and is very efficient to operate.